Materials and Care: 100% polyester. Spot clean only. 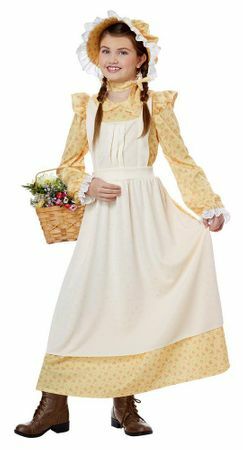 Girls love the pretty pioneer dress detailing on our Prairie Girl costume set in children's sizes from Candy Apple Costumes. The light yellow long-sleeved dress with pink floral print has an attached ivory pinafore apron. White eyelet lace decorates the sleeve cuffs. A matching yellow and pink floral bonnet with eyelet lace trim is included with this popular pioneer dress costume set for girls. Our custom sizing chart for this costume can help you decide on a girl's extra-small, small, medium or large.